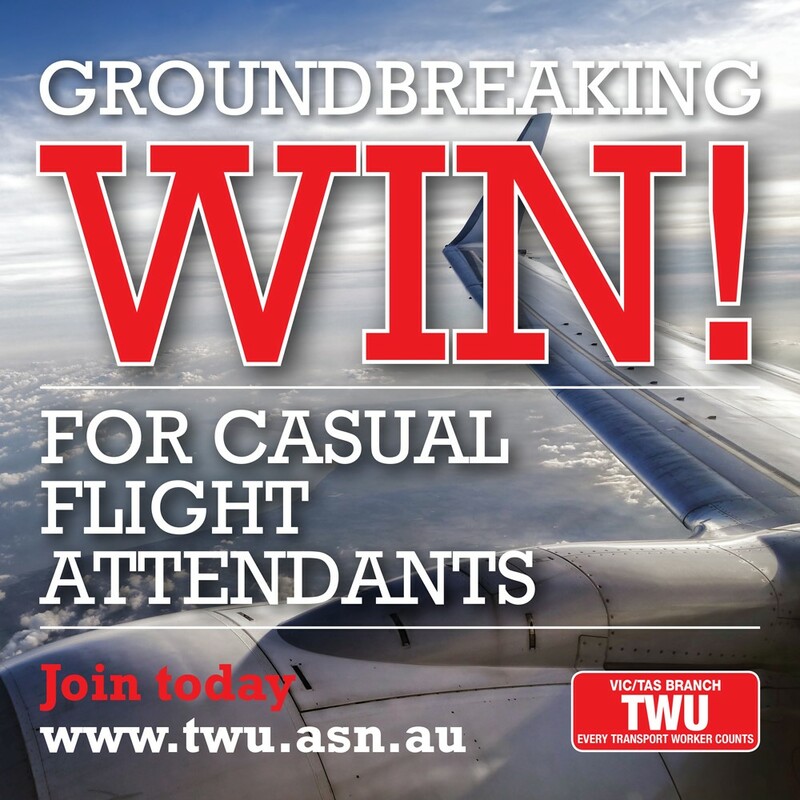 The TWU (Vic/Tas) Branch had another big win this week after recovering back pay for a casual short-haul Qantas flight attendant. The member won two months in lost wages after being unfairly sidelined without pay due to a documented pregnancy-related medical condition. The TWU stepped in to assist the member as she had been unfairly treated and not supported by Maurice Alexander Management (MAM) to perform ground duties. The matter was heading to the Fair Work Commission before MAM – an aviation support service company that provides casual Short-Haul Flight Attendants for Qantas – made the settlement offer. The member has sent a ‘huge thanks’ to the TWU and particularly Aviation Organiser Dissio Markos and Qantas Delegates Glenn Barfoot and Paul Joyce for their assistance. “They fought hard and we had a great result with my management agreeing to back pay me for the time I was at home,” she said. Dissio said the win was important for all TWU members and casual workers who could be discriminated against due to pregnancy. “Workers need constant income, especially at one of the most important times of their lives, and we fought and helped this member stand up against something that was clearly very wrong,” he said. Branch Secretary John Berger said the TWU would never, ever tolerate an employer discriminating against women, especially a pregnant woman. “This member should have been receiving all the available supports from this employer, but instead of that she was disadvantaged by getting pushed aside without pay because she was pregnant. We will never stop fighting against gender inequality in the workplace while it continues to happen,” John said.